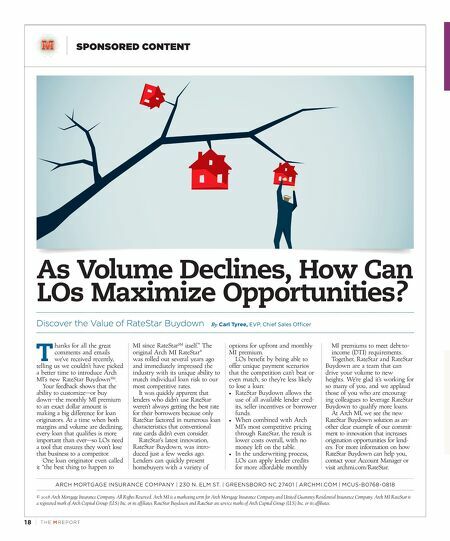 18 | TH E M R EP O RT SPONSORED CONTENT As Volume Declines, How Can LOs Maximize Opportunities? Discover the Value of RateStar Buydown By Carl Tyree, EVP, Chief Sales Officer T hanks for all the great comments and emails we've received recently, telling us we couldn't have picked a better time to introduce Arch MI's new RateStar Buydown SM . Your feedback shows that the ability to customize—or buy down—the monthly MI premium to an exact dollar amount is making a big difference for loan originators. At a time when both margins and volume are declining, every loan that qualifies is more important than ever—so LOs need a tool that ensures they won't lose that business to a competitor. One loan originator even called it "the best thing to happen to MI since RateStar SM itself." The original Arch MI RateStar ® was rolled out several years ago and immediately impressed the industry with its unique ability to match individual loan risk to our most competitive rates. It was quickly apparent that lenders who didn't use RateStar weren't always getting the best rate for their borrowers because only RateStar factored in numerous loan characteristics that conventional rate cards didn't even consider. RateStar's latest innovation, RateStar Buydown, was intro - duced just a few weeks ago. Lenders can quickly present homebuyers with a variety of options for upfront and monthly MI premium. LOs benefit by being able to offer unique payment scenarios that the competition can't beat or even match, so they're less likely to lose a loan: • RateStar Buydown allows the use of all available lender cred- its, seller incentives or borrower funds. • When combined with Arch MI's most competitive pricing through RateStar, the result is lower costs overall, with no money left on the table. • In the underwriting process, LOs can apply lender credits for more affordable monthly MI premiums to meet debt-to- income (DTI) requirements. Together, RateStar and RateStar Buydown are a team that can drive your volume to new heights. 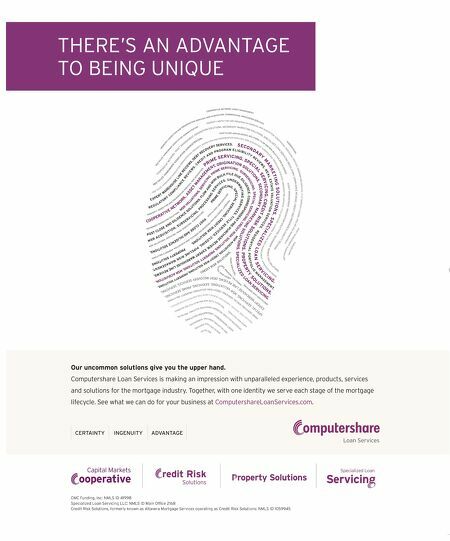 We're glad it's working for so many of you, and we applaud those of you who are encourag - ing colleagues to leverage RateStar Buydown to qualify more loans. At Arch MI, we see the new RateStar Buydown solution as an - other clear example of our commit- ment to innovation that increases origination opportunities for lend- ers. For more information on how RateStar Buydown can help you, contact your Account Manager or visit archmi.com/RateStar. ARCH MORTGAGE INSURANCE COMPANY | 230 N. ELM ST. | GREENSBORO NC 27401 | ARCHMI.COM | MCUS-B0768-0818 © 2018 Arch Mortgage Insurance Company. All Rights Reserved. Arch MI is a marketing term for Arch Mortgage Insurance Company and United Guaranty Residential Insurance Company. Arch MI RateStar is a registered mark of Arch Capital Group (U.S.) Inc. or its affiliates. RateStar Buydown and RateStar are service marks of Arch Capital Group (U.S.) Inc. or its affiliates.